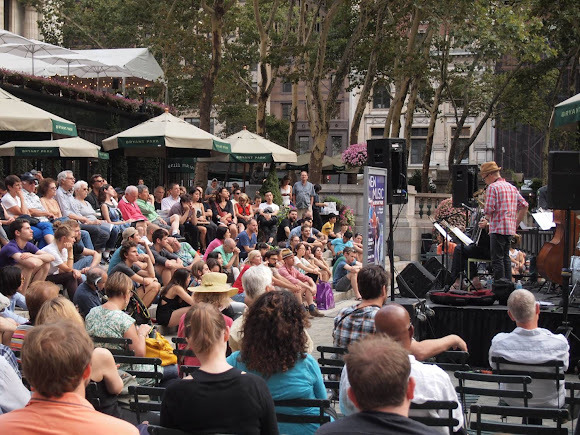 To celebrate the return of many Bryant Park summer programs, and to introduce our readers to our fantastic partners, we asked our partners to write guest blog posts. Dan Fishman, Programming and Events Associate here at the park, interviews Margaret Lioi, CEO of Chamber Music America, which is a co-producer of New Music in Bryant Park. Dan Fishman: Hi Margaret – thank you for taking some time to talk with me today. My first question is a broad one – what is this series about for you? What do you tell someone who has not been before? Margaret Lioi: Hi Dan, thank you. As you know, Chamber Music America (CMA) is the national network for chamber music professionals. A large part of our mission is to help chamber music professionals make a career in the life they have chosen, and one way we help them is by providing funding. Our biggest funding initiative is for the creation of new works of music. We put a lot of resources into our commissioning program and we hope that the resulting music is played more than a few times. 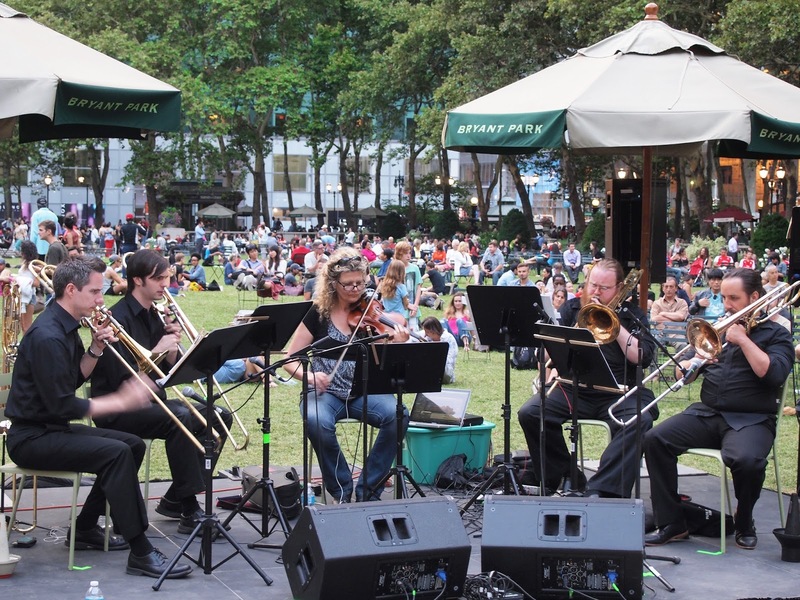 New Music in Bryant Park offers a great opportunity for the musicians to perform the commissions in a great public setting. Another focus of CMA is to help audiences develop a taste for new music, and this series does that well. One of the great things about Bryant Park is that it attracts a diverse group of people. There are people who love new music who come just for the concert; people of all sorts walking by; and many people sitting in the park who hear the music and are drawn into it. The outdoor venue is so inviting – when people are here with their children on the lawn and you see their children dancing to the music it just really makes you smile. New Music in Bryant Park brings the best and newest music to our urban oasis. DF: Great. I think so, too. For me the most exciting thing about this series is that some of the highest quality musicians in New York are playing in front of audiences that are not accustomed to new music. I think it builds the audience for jazz and classical music. Can you tell me more about these excellent musicians? Are there any musicians who you are particularly excited about? ML: Well, all of these performers are members of CMA and we love them equally. I would say though that all of the artists have gone through an extremely competitive process to be selected for the commissioning award. We often have 100 or more classical music applications for ten or so commissions, and almost double the number of jazz applications for the same number of commissions. Everyone who is selected is extremely qualified. So, you are right when you say, Dan, that these are excellent artists. DF: Can you tell me more about the mix of jazz and classical music? It’s not every day that you see both on one program. ML: One reason why this series is unique is the combination of classical and jazz commissions in one concert. Even among the many performance venues in New York City that combination is hard to find. Chamber music includes both jazz and classical groups, so we wanted to showcase the range of new chamber music with each performance. DF: The biggest change from last year is the addition of the first-ever New Music Festival: with six ensembles performing over five hours. Can you tell me more about what that will be like? ML: Everyone likes festivals, and I think it will draw a larger audience. I expect that the lawn will be full with people bringing food for a picnic. It will also be a great chance to see classical and jazz music played one after the other and to listen to music that borders between jazz and classical. It will also be a great overview of different kinds of new music: different instrumentation, different sounds. It will be a great chance for people to learn what they like. DF: I am looking forward to it! Before you go, Margaret, is there anything else that you would like to add? ML: Just one thing. As New Yorkers we think we are on the cutting edge of everything. We want to go to the newest restaurants, read the newest books, and go to the newest movies. Sometimes when it comes to new music, however, we in general are a little less adventurous. I think this series is a really great offering to residents and visitors to sample something new that they would not otherwise hear.